Destiny's year 2 DLC called The Taken King includes a brand new collection of Exotic weapons; around 12 exotics in total which is half as many exotics as the entire first year combined! In this post I'm going to list all of the new exotic weapons in The Taken King together with details for unlocking each of them, weapon stats and of course their rating on the battlefield. Before I start, a warning that this post will change over time; right up til the DLC launches and also afterwards as Bungie nerfs and balances weapons in the game. Therefore, expect the rating to change from time to time, but other than that the way you unlock each of the exotics should remain the same. The first of it's kind in Destiny, the Railgun weapon type is actually a Fusion Rifle which occupies the heavy weapon slot. As you probably know, the heavy slot is shared by other weapons such as Machine Guns and Rocket Launchers - all of which offer substantial impact ratings but low fire rates. Fusion Rifles are your typical charge and release weapon, where players use good timing to unleash a directed laser blast at enemies. The Heavy weapon version of the Fusion Rifle is similar in some ways to a classic Fusion Rifle but far more devastating than the original. Here's why: Players can hold down the charge trigger, which takes slightly longer to charge, and then at the right moment unleash a powerful energy blast that both over penetrates and also ricochets off walls. This makes it the ideal weapon for groups of oncoming enemies or those that are huddled together. The ricochet effect works well in enclosed rooms where the bounce effect can immediately impact other enemies in the vicinity (particularly useful round corners in PvP). The name of the first Railgun weapon in TTK is called the Sleeper Simulant, and its only available through Banshee's Exotic bounty quest (see below for more information). A truly unique looking exotic with one of the most overpowered perks in Destiny's history. 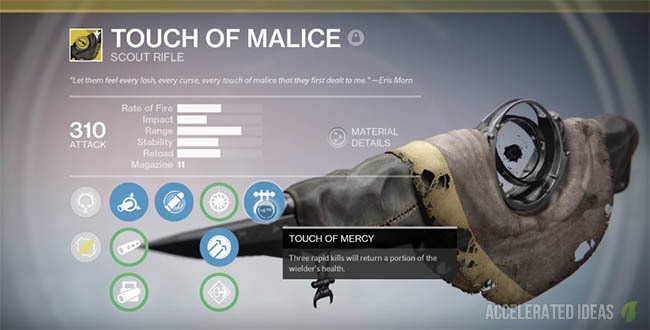 The Touch of Malice is rewarded following a complex sequence of Quests, requiring a scavenger hunt on the Dreadnaught for Calcified Fragments and also a obligatory trip through the Kings Fall Raid. The weapon itself comes with two perks that make sense given the guns name. "Touch of Mercy" - rewards players with health following three rapid kills. "Hunger Pangs" Quest - Play the Undying Mind strike and collect Essence of the Feast (from Taken in same room as final boss) then the Phobus mission for more Essence. Play the Daily Heroic mission "Lost to Light"
Deter from the mission and instead follow the route leading above ground to the "Dusk Warren"
Ghost will say "Strange, I'm picking up a Fallen distress signal"
Unique attribute: Over-penetrates enemies and ricochets off walls. A heavy weapon Fusion Rifle that offers players a high intensity lazer blast which over penetrates and also bounces off walls. Players can upgrade the Sleeper Simulant prototype (by visiting Banshee) to increase the bounce rate and intensity of the weapon. The Sleeper Simulant weapon is locked behind a simple series of quests that players must acquire from Banshee. The quest line starts by taking players to varying planets to decode a secret sequence and finally concludes with an Exotic quest on a high level Fallen SABER strike. 1. Collect all 4 Fusion Rifle Relics and return them to Banshee (these are random drops anywhere in the game). 2. Complete mission "The First Firewall" to receive the "Curious Transceiver". 4. Complete mission "Shadow Call" - reach the top of the Devil's Spire in a time limit. Reward is the IKELOS Fusion Core. Heavy Power Coupling - Dismantle any legendary (or exotic) heavy weapon. Ionized Shell Harmonics - Complete the Archives mission on Venus (easy difficulty is fine). WARSAT//MK19/TERRA/RSPN - Complete a 'Defend the Warsat' public event on Earth. WARSAT//MK19/LUNA/RSPN - Complete a 'Defend the Warsat' public event on the Moon. 6. Return the "Reassembled IKELOS Fusion Core" to Banshee. 8. Return the Weapon Frame to Banshee to collect the Sleeper Simulant exotic weapon. Disappointing. This weapon was rumored to be the new Gjallarhorn but in reality it's extremely high impact rating is let down by a very low ammo count and a terribly slow fire rate. Unique Perk: Precision kills will grant a brief increase to Handling, Range, Rate of Fire, and Stability for this weapon. The Chaperone is an exotic shotgun which fires a single slug shot and provides the player with an Agility boost when equipped - much like MIDA multi tool. Kill guardians in the Crucible with The Last Word equipped (deaths reduce progress, kills increase progress). Unique Perk: Sticky void projectiles that explode after a short delay. Whoa, now we've got a real beauty here!! The Telesto is an exotic fusion Rifle that attaches projectiles to enemies that detonate with a delayed Void blast. Kind of like a sticky grenade launcher and lazer in one. Gaining multikills with this weapon will also drop Orbs for your allies to pick up. The Telesto is a sleek looking weapon too with clean cut metallic edges. You can bet that this weapon is going to be really hard to come by...certainly no Xur sales here. Exotic Perk(s): Precision hits will refill the mag (similar to Black Hammer) and the weapon can be fired in full auto mode. This weapon is an exotic version of the Stranger's Rifle (a primary Pulse Rifle). "No Time to Explain" is a classic line from Destiny's story, which has since been used repeatedly in forums and on reddit to mock a particular explanation. The actual Stranger's Rifle weapon is a rare Pulse Rifle, received as a quest reward from the Exo Stranger. In early 2015 this weapon received a buff which accounted for it's overwhelming use in PvP and the suggestion from Destiny fans that the Strangers Rifle should have been an exotic from the start. Looks like the time has come now! Pulse rifles are currently more effective than auto rifles, but less favourable than scout rifles and hand cannons. Primary weapons also come with an abundance of ammo and it's not usually something you worry about. However, No Time to Explain can be fired in full auto mode and comes with the option of Speed Reload as a middle tier perk, thus making it a decent primary exotic but certainly not up the same standard as Zhalo Supercell. 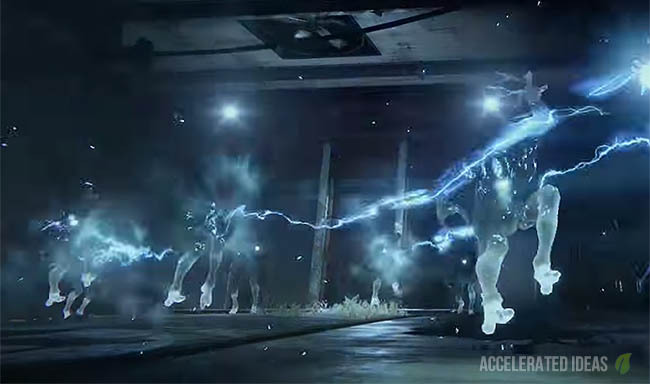 Unique Perk: "Zhalo Supercell" - Fires chained lightning, similar to the Warlocks Stormcaller subclass. 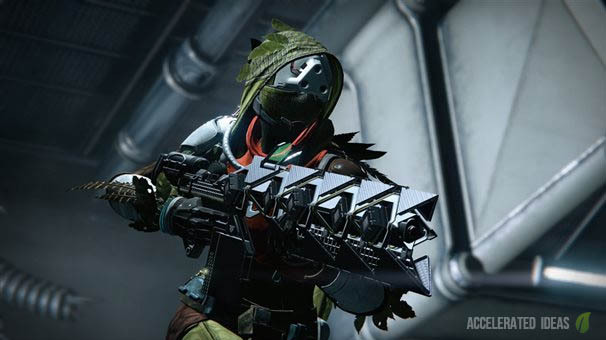 This Arc damage auto rifle is small in appearance, looking similar to a typical AK47. It has a massive ammo count (300+, see image) a clip size of 36 and a very high rate of fire. Its unique perk offers chain damage by bouncing off nearby enemies. This is surprisingly overpowered, matching the melee effects from the Warlock's Stormcaller subclass. According to Bungie this weapon can only be acquired through Xur or by an RnG drop. I received mine through an exotic engram. Unique Perk: "Life Support" - killing enemies with this weapon when critically wounded have a chance to start regenerating health. Fabian Strategy is an exotic Auto Rifle which is rewarded through a Taken King quest. It has a high rate of fire and low impact rating, similar to many of the earlier expansion auto rifles. Another of the class specific Exotic weapons, Fabian Strategy can ONLY be equipped by Titans. Follow the same process as before; increase the Gunsmith rank to level 3, then accept and complete the Exotic quest to obtain this weapon. Unique Perk: None. This weapon combines three well known perks that include: "Maverick" - Precision kills move one round from your ammo reserves into the magazine and "Firefly" - enemies explode on impact. Ace of Spades is a stylish exotic Hand Cannon that comes bundled with Firelfy, Maverick and Third Eye perks. Players will enjoy a permanent radar while aiming in addition to reduced reload requirements thanks to the precision kill rewards. ONLY Hunters can equip this exotic weapon which is acquired through a Gunsmith Quest (see details below). Unique Perk: "Eye of the Storm" - this weapon becomes more accurate as your health gets lower. An exotic Scout Rifle, Tlaloc comes with "Overflow" and "Eye of the Storm" perks; providing better weapon stats (e.g rate of fire) while the players Super is fully charged and the weapons accuracy also improves as the players health decreases. Increase your rank with the gunsmith to rank 3. He will then give you a new Exotic quest to obtain Tlaloc, which can ONLY be equipped by Warlocks. Unique Perk: "The First Curse" - precision kills while aiming down sights grant increased range and stability until the next reload. This exotic Auto Rifle comes with two fairly similar perks; "The First Curse" and "Dead Eye". Both of these perks improve the weapons range and stability when aiming down the sights; "The First Curse" provides the reward following precision kills whilst "Dead Eye" is a constant perk rewarded by simply aiming down the sights. Unique Perk: "The Fate of All Fools" - Chain body shots to gain bonus damage on your next precision shot and return ammo to the mag. It's been a long time coming but "The Jade Rabbit" is officially an exotic Scout Rifle included in The Taken King. It's still not clear where or how players can acquire this weapon but it's likely to be a rare RnG reward. Unique Perk: "One way" or "Another way" - gain bonus agility for on precision kills or bonus armour on non-precision kills. Boolean Gemini is one of the more interesting exotic weapons in The Taken King. It's unique perk comes as a set which the players has to pick between. Do you prefer more agility for precision kills or bonus armour for non-precision kills. These perks work perfectly; helping you gain speed against lighter foes whilst rewarding you with armour following a sustained firefight against a stronger opponent. If your rank is lower than 3, I suggest doing the daily Queen bounties and also replay the House of Wolves quests which can be picked up from the Abandoned quests kiosk (in the Hall of Guardians). Unique Perk: "Blinding Light" - Blinds nearby enemies following precision hits. 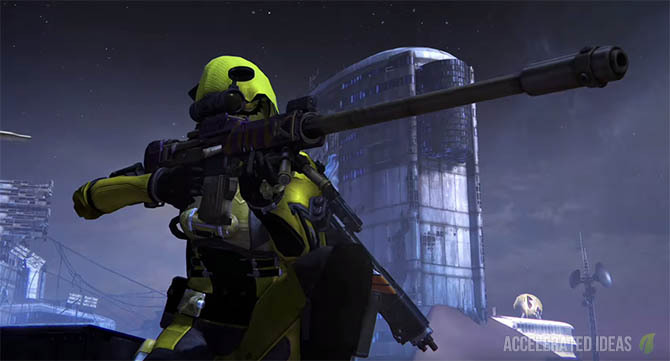 This exotic Sniper Rifle can cause all sorts of confusion, both in PvP and PvE. It's delayed blind effect takes some getting used to though (see video). With a Helm of Saint 14 type perk, players can easily blind groups of enemies for their teammates to swoop in and clean up, so long as those enemies get caught in the blind "bubble". Hereafter is one of my favourite exotics from The Taken King - it can be an overpowered tactical monster in the right hands and in the right situations. Players earn Hereafter from RNG rather than a dedicated quest. It's certainly early days but I'm going to guess that this Sniper Rifle will be among the best weapons in The Taken King. Certainly not favourable for the single player or solo nightfalls, but when used in a team this weapon could cause considerable mayhem. Unique Perk: "Sword of Thunder" - fire a beam of Arc Light from your sword creating a lingering electrical storm. The first of the Exotic swords in The Taken King. The Bolt-Caster is true to its name offering a unique perk that allows players to charge and fire a beam of Arc Light from the sword, leaving an electrical sword in its wake. We can only begin to imagine the potential of this weapon! Players can earn this exotic through three channels: Shaxx Crucible Handler, an Exotic quest or RnG reward. Unique Perk: "Supermassive Vortex" - unleash a spiral of Void energy in all directions. Dark-Drinker is another exotic sword; this time focusing on Void damage rather than Arc. It's unique perk unleashes a circular, short range attack that'll clear the immediate area of foes. Unique Perk: "Phoenix Uppercut" - a Solar Light uppercut. The Solar version of the Exotic sword class, Raze-Lighter is going to make wizards cry. It's unique perk is a close range uppercut that deals tremendous damage to a single foe.